Hanoi (VNA) - Budget revenues were estimated at 280.9 trillion VND (12.4 billion USD) in the first quarter of this year, up 15.2 percent compared to the same period in 2016 and meeting 23.2 percent of the annual estimate, the Ministry of Finance (MoF) said on April 10. Domestic collection for the period was 232 trillion VND, equivalent to 23.4 percent of the projected revenues, and 13.3 percent higher than the same period last year. 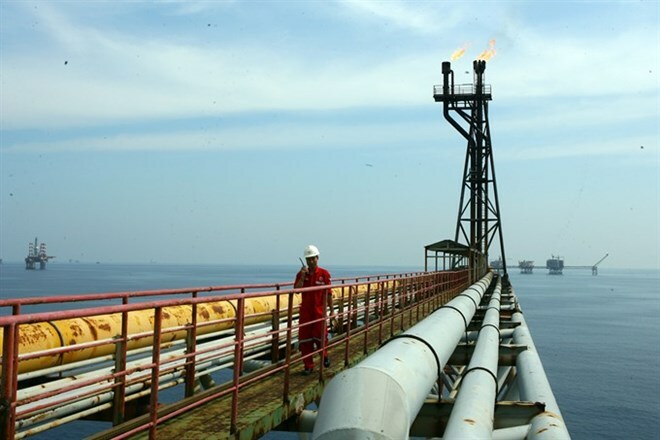 In March, revenues from crude oil exports were estimated at 3.95 trillion VND, down nearly 400 billion VND compared to the previous month due to large redundant supply, the MoF said. However, budget revenues from crude oil exports in the whole quarter reached roughly 11 trillion VND, meeting 28.9 percent of estimates, up 15.9 percent against 2016. Import-export activities contributed 66.8 trillion VND to the State budget, totaling 18.5 percent higher than the same period last year, and equalling 23.4 percent of targeted revenues. Budget collections from production and business activities grew strongly compared with last year, with 25.4 percent collected from the private sector, 30.3 percent from personal income tax and 35.2 percent from housing and real estate tax. The increase in revenue may also be attributed to the vigorous economic growth in the last quarter of 2016, with GDP growth in the fourth quarter estimated at 6.68 percent, the MoF said. Meanwhile, budget expenditure reached nearly 285 trillion VND in the first quarter, up 7.8 percent from the same period last year and equivalent to 20.5 percent of the annual plan. Expenditures for development investment were recorded at 44.1 trillion VND, while debt payment and interest expenses totalled 29.1 trillion VND, and regular spending reached 211.2 trillion VND.